Congratulations to the 4 winners of the Inaugural Library Undergraduate Research Awards! 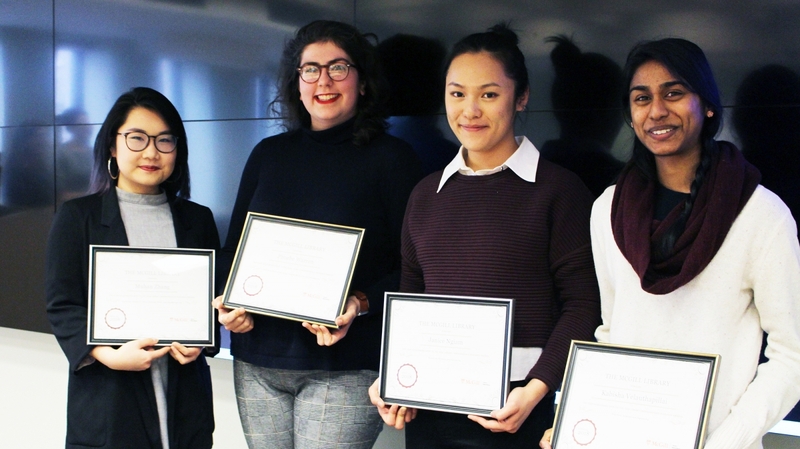 The recipients were selected for best demonstrating the use of library services and resources in the creation of a research project or creative work and demonstrating an excellent understanding of the connection between research and library services and resources. Awards were presented in two areas: 1) Humanities, Social Sciences, Music, Law, and Management, and 2) Sciences and Engineering. Phoebe Warren, Political Science and History, for her course project for HIST 431 - Queer America entitled "The Lavender Scare Legacy: A Policy & Law Sourcebook on U.S. Department of State Employment and Hiring Discrimination Against Queer Americans". Kabisha Velauthapillai, Environmental Studies, for her Honours Thesis entitled "Environmental concerns within Montréal’s Ilankai Tamil community: A tentative report". Muhan Zhang, East Asian Studies and Art History, for her Honours Thesis entitled "Envisioning Diasporic Art: Chinese Canadian Art in the Global Contemporary. A Comparative Case Study of The Works of Gu Xiong and Karen Tam". Janice Ngiam, Sociology for her course project for GEOG 550: Historical Ecology Techniques entitled "How can different mapping sources be used to reconstruct historical landscapes? The case of Daly Point, New Brunswick".